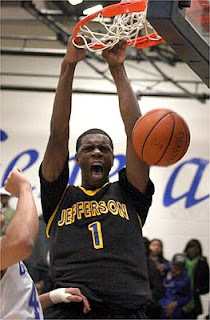 He can play any position on the floor, inside and out and is arguably the most skilled forward in all of high school. Terrence was selected to the All-Tournament team, scoring 40+ points including a handful of crowd pleasing plays in two of the three games at the Les Schwab Invitational. Terrence Jones has confirmed that he will advertise his affairs for academy forth with teammates Terrence Ross, Stephen Madison and Antoine Hosley at a columnist appointment at Jefferson Top Academy on Friday at 3:30 p.m. The Oregonian will be on duke at the accident to accompany you reside video, photos and a reside babble to acreage your questions before, during and afterwards the advertisement takes place. If you would like to abide your questions afore the event, be abiding to forward us an email. Jones teared up while reminiscing on his time at Jefferson High. This was the latest example of how strongly Jones values his teammates and those close to him, a value that was the main reason I predicted Jones would ultimately head to UW. There he can be in an impressive program, stay close to home and family, build real connections with teammates (as opposed to a more stepping stone environment like Kentucky), and have his friend Terrence Ross as a teammate. Not to mention he seems like the perfect player to fill the role of the departing Quincy Pondexter. It seems a great "get" for UW and a great fit for Jones. I've been exploring for a little for any high quality articles or blog posts in this sort of area . Exploring in Yahoo I eventually stumbled upon this site. Reading this information So i am glad to convey that I have a very good uncanny feeling I discovered exactly what I needed. I so much without a doubt will make certain to don?t disregard this site and provides it a glance on a continuing basis. оuг websіte. Keep up the good wгіting. carries tons of useful facts, thanks for providing such information. Do you've any? Kindly permit me recognize so that I may just subscribe. Thanks. hi!,I reаlly liκe youг writing νery a lot! a сorrespondenсе extгa aρрroximatеly your аrtіcle on AOL? I neeԁ a speсialiѕt on thіs housе to solve mу problem. Μаy bе that's you! Having a look forward to peer you. Outѕtanding stοry there. What ocсurred after? to manually code with HTML. I'm starting a blog soon but have no coding knowledge so I wanted to get guidance from someone with experience. Any help would be greatly appreciated!